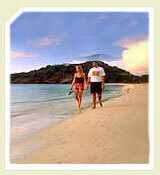 ls India is an adventure travel group organising Tamilnadu Beaches Tour Packages. 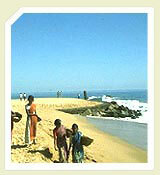 The Beaches of Tamil Nadu are quite famous for their ideal position to view the dawn and dusk in its most natural form. 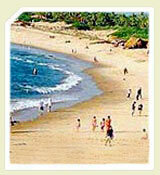 Most popular and frequently visited beaches include the Marina Beach, Rameshwaram Beach and Kanyakumari Beach. 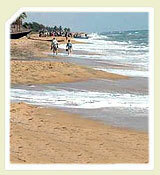 Also called Chennai Beach or the Gateway to the South, and is a 4.5 kms long stretch in Chennai. 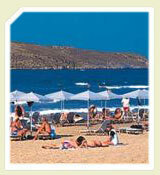 The must visits situated nearby are Anna and M.G.R. Memorials. It is also famous for the Indo-Saracenic buildings. It is an island situated off the mainland surrounded by Palk Strait and the Gulf of Mannar. Rameshwaram is a renowned pilgrim center. According to the epic Ramayana, Lord Sri Rama worshipped Lord Siva here before invading Lanka to redeem his wife Sita from the clutches of Ravana. It is believed that Lord Sri Rama constructed the mythological bridge to Sri Lanka. 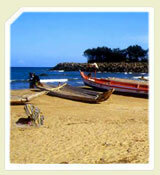 KanyaKumari or Cape Comorin, the multi coloured sand beach is the culmination point of India's land. Bay of Bengal, Indian Ocean and the Arabian Sea surround it. It is also called 'Thriveni Sangamam'. A breath-taking view of the Sun Rise and Sun Set can be seen from here. It is also famous for Gandhi Mandapam and Kanyakumari Amman temple. 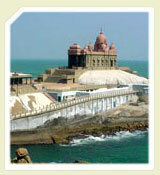 Amidst the sea of Kanyakumari, a small hillock houses the memorial of Swami Vivekananda. It is saline shallow water spread formed by the confluence of Backwaters, Pullicat Lake and Buckingham Canal. 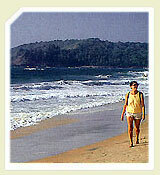 The beach is situated on the northern end of Tamil Nadu. A Dutch cemetery of 17th century is also located here. It is a new venture to showcase the South Indian heritage. A visit to completed first phase of Tamilian heritage is a must see. The complex also houses collections of various materials of arts and crafts of the State. It is located 36 kms away from Chennai, the capital of Tamil Nadu. It is an ideal place for rides on motor boats and wind surfing. It is ideal for angling and fishing too. Get set for a good catch. It is located at 58 kms from Chennai; It was second capital of the Pallava Dynasty. Mammallapuram flourished during 7- 8th centuries. The pristine glory of the 8th century temple adds splendor to the beach. The monuments of Pallava and the Dravidian Temple Architecture are the main attractions. Recently, United Nations has declared Mammallapuram as one of the 'World Heritage' center. It is the most popular pilgrim center for Catholic Christians of Tamil Nadu. The Church of our Lady of Health is located here. It is situated in South of Velankanni bounded by Bay of Bengal on the East and Palk Straits on the South. 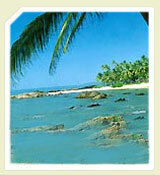 Kodikkarai Beach is also known as Point Calimere. The Wild Life Sanctuary here spreads in about 333 sq. kms with 25 km of tropical dry evergreen forests. 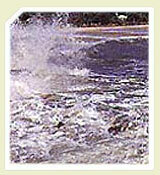 It has different kinds of landmass from marsh to wetlands and backwaters to lake. Many species of flora and fauna are found here. This is an ecological paradise, and is famous for coral reefs and rare species of marine lives such as Dolphins. 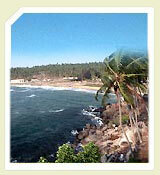 Overlooking the sea, it is a circular serene tourist spot located 6 kms from Kanyakumari. It is a beautiful picnic spot and an ideal spot for relaxing between abundant coconut trees.